Warren Cromartie said being back in Japan made him feel like he was home. 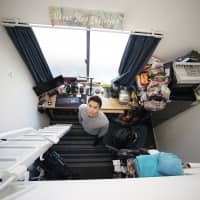 He said there were fans who recognized him while he was out and about in Tokyo and that he’d already made plans to have dinner with a few of his former Yomiuri Giants teammates later in the week. If there’s time, he said, he’d also like to take in a baseball game. Cromartie is hoping that last one will be an option in another place he calls home, Montreal, Canada, in the near future. 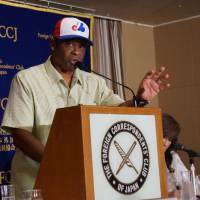 The former Expos and Giants outfielder held court at the Foreign Correspondents’ Club of Japan for about an hour Monday night. Cromartie, 62, flashed his familiar grin and donned one of the Expos’ famous tricolor home hats, before switching to a Giants cap about midway through. He spoke about his love of Japan and the Giants, but also about his goal to bring MLB back to Montreal, which has been without a team since the Expos relocated to Washington, D.C., becoming the Nationals, after the 2004 season. Cromartie will be in Japan for a little over a week. 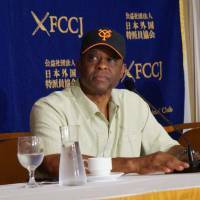 He’s one of three former major leaguers who will be in Ishinomaki, Miyagi Prefecture, for the finals of the MLB Cup, a youth baseball tournament for fourth- and fifth-graders being hosted by Major League Baseball Japan and run in conjunction with Little League Baseball Japan. 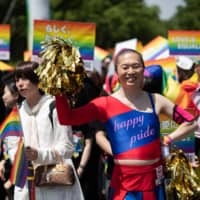 The MLB Cup began with 150 teams from across Japan, with 16 making it through to Ishinomaki, which was among the hardest hit areas during the Great East Japan Earthquake and the ensuing tsunami. Cromartie, and former MLB pitchers Kazuhisa Ishii and Hisanori Takahashi will hold clinics for the participating teams. 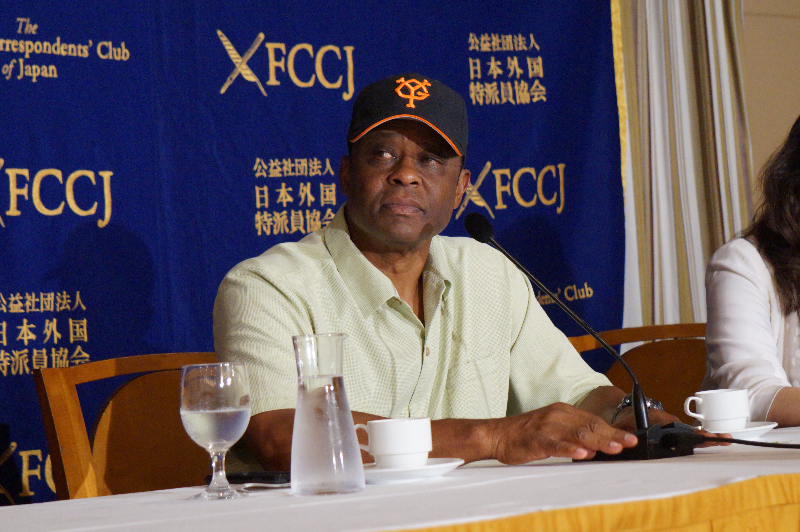 Cromartie spent seven years in Japan with the Giants, hitting .321 with 171 home runs and driving in 558 runs. In 1989, he was named Central League MVP. He called his time in Japan “a wonderful experience” and one his family still talks about. 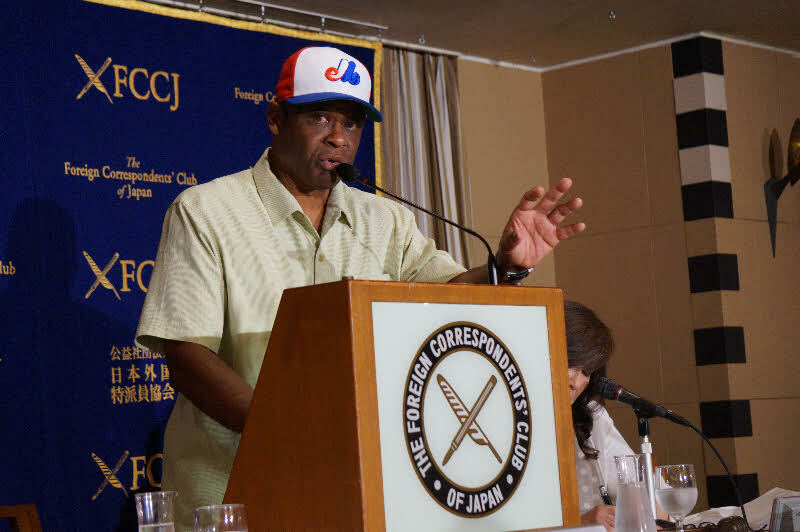 Before coming to Japan in 1984, Cromartie spent nine seasons (1974-83) with the Expos, competing alongside players such as outfielder Andre Dawson and catcher Gary Carter, both now in the Baseball Hall of Fame wearing Expos caps. Cromartie was on the 1981 Expos team that won the NL East Division title, in a split season, and reached the National League Championship Series — the only time the team participated in the postseason while in Canada. Cromartie, among the more popular players for the team, said the absence of things acknowledging the franchise’s time in Montreal inspired him to begin his quest to get baseball back in the city. Currently, Cromartie serves as CEO of the Montreal Baseball Project, a group dedicated to that cause. He said there’s been great progress and noted Montreal was at the top of the list should baseball expand or a team relocate. Cromartie said the team would need a 35,000-seat venue downtown for any potential team, saying Olympic Stadium wasn’t an answer. 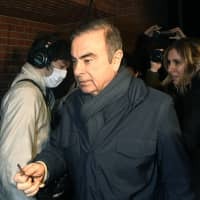 He also said he’d love to have Japanese involvement in the project. “We’ve already had one Japanese owner, for the Seattle Mariners. 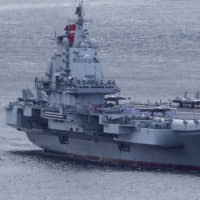 Montreal is looking for another one,” he said. Cromartie said he began his journey almost five years ago, and still has the same passion to see the team return. 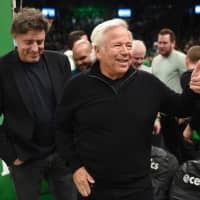 He noted the enduring popularity of the club, and the success of recent MLB exhibitions in Montreal as positives on the road to his ultimate goal.